Having untouched beauty, these newly known beaches in Vietnam (Việt Nam) will give you a full contemplation of natural beauty and let you enjoy peaceful relaxation. From Hai Ha (Hải Hà) port of Mong Cai (Móng Cái) city, Quang Ninh (Quảng Ninh) province, if you go by boat about 40 minutes, you will arrive in Cai Chien (Cái Chiên) Island. 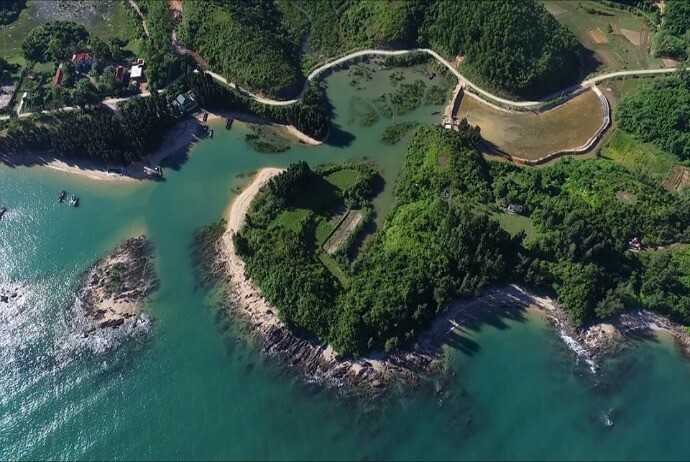 This is a unique island of Hai Ha (Hải Hà) commune, about 330 km from Hanoi city. This island possesses charming beauty which is a combination between forests and sea. The green color of forests hugs the blue color of the sea, creating a special allure for travelers. 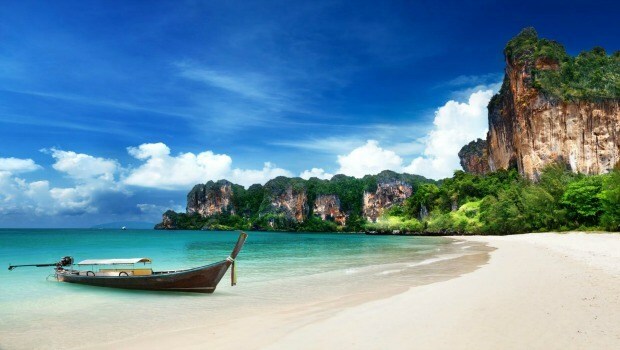 The white sandy beaches will cling the footsteps of tourists coming here. Nowadays, the roads on this island have been paved, and electricity is supplied so every activity becomes more convenient. Especially, there is also tram service. This island is a great place for tourists to explore unspoiled scenery with countless nooks hiding pleasant surprises. In addition, camping, barbecue party held right on the beach, picking up the dawn on the vast sea, and listening to the birds singing will bring unforgettable memories for your trip. You can also take a boat from Dau Rong (Đầu Rồng) beach through Thoi Xanh Island or go fishing at the docks. The cost for the trip is not high, only about 350,000 VND / 2-bed room, feasting around 200,000-250,000 VND / person. It takes more than 1 hour by boat to go from Cau Da (Cầu Đá) port to arrive Hon Noi, a canary island belonged to Nha Trang, Khanh Hoa (Khánh Hoà). The unique feature of Hon Noi is that there is the only one double beach in Vietnam. 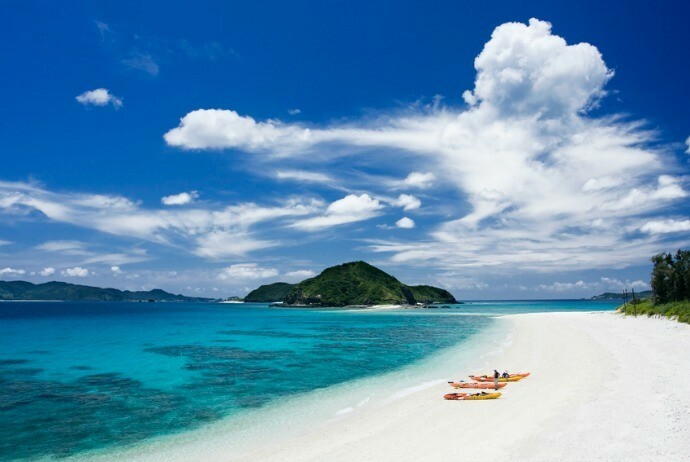 Here, you can stand in the smooth white sand, and see blue sea all around. Not stop there, this double beach also has one side of hot water and the other cold water created by the flows, making many tourists who used to visit not be able to forget. The calm sea allows you to swim delightfully, contemplate live coral and colorful fish. You can visit Du Ha (Du Hạ) Mountain located on the island of 90 meters in height which is near the sea to enjoy the panoramic beauty of the sea and sky. Do not forget to visit canary cave and learn about how to raise canaries, particularly in March and August, which is the time canary nests are harvested, you will know a lot of interesting things. From Hon Noi, it takes just a few minutes of going by boat to discover Hon Ngoai (Hòn Ngoại), Hon Sam (Hòn Sam). However, this place is not suitable for self- sufficient travel. You cannot stay overnight here, but have to follow the tour of travel companies, with about 350,000 VND / person. The services include breakfast with pastries and mineral water, lunch at a restaurant on the island, snack with fruits in the afternoon, hotel shuttles, boat to go to the island, glass bottom boat to watch coral, and tour to visit canary cave. Very week, there are about 2-3 turns to go to this island and each up to 25 people. Tour is only open from March to September because boats do not operate in other months due to heavy waves and storms. Mat Rong Island (Dragon Eye Island) is another name of Bai Dong (Bái Đông) island located at the southern edge of Ha Long (Hạ Long) Bay, Quang Ninh (Quảng Ninh) province. With an area of 30 ha, the surroundings of this island are limestone mountains. Wild beauty present clearly through the green space, two large stone blocks covering mountain sides, stretching white sandy beaches. The place that cannot be overlooked is the gorgeous blue water flow in the heart of the mountain, bringing the nickname “Mat Rong (Mắt Rồng)” for this place. “Mat Rong” is very large but just about 1 meter in depth, and owns the most impressive ecosystem of Gulf of Tonkin. If you want to get into there, you should go along the stairs to the top of mountain and then walk down the mountain before disengaging yourself on the water, kayaking to discover attractive things in the heart of the island. To get to this island, you need to hire a boat in advance, with the cost of about 2-6 VND millions depending on the number of tourists. The cost to get onto the island is 150,000 VND/person. Located off the coast of Kien Giang (Kiên Giang) province, Mong Tay (Móng Tay) island belongs to Duong Hoa (Dương Hoà) commune, Kien Luong (Kiên Lương) district. This island will allow you to enjoy the absolute privacy and also unforgettable but adventurous experience. 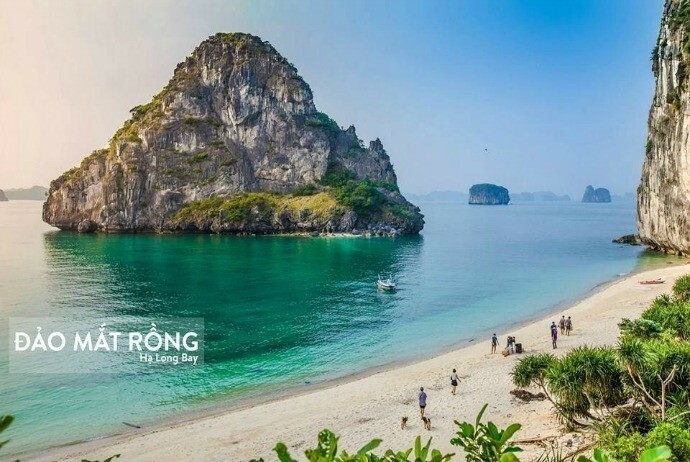 The tour of discovering Mong Tay (Móng Tay) island in 4 days 3 nights costs about 1.6 VND million / person. From Ha Tien (Hà Tiên) pier, you go to Phu Quoc (Phú Quốc) and then An Thoi (An Thới) port. After that, go by a canoe to get to Mong Tay Island. This is an ideal place for discovering activities, going fishing, picnicking, particularly diving to contemplate coral reefs which are considered as the richest in Vietnam. The sea water is like a jade silhouetting the green palm trees that allows you to delightfully bath. Also, you will see many strange shaped rocks, grassland stretching in the island and nail trees. The sunset on this island will bring to you the vibrating feelings. During your staying time here, you will be fully immersed in nature, listen to the crashing waves, blowing wind and all of your worries will be disappeared. Ky Co is located at the foot of Phuong Mai (Phương Mai) mountain in Nhon Ly (Nhơn Lý) commune, about 25km from Quy Nhon (Quy Nhơn) city to the Northeast. 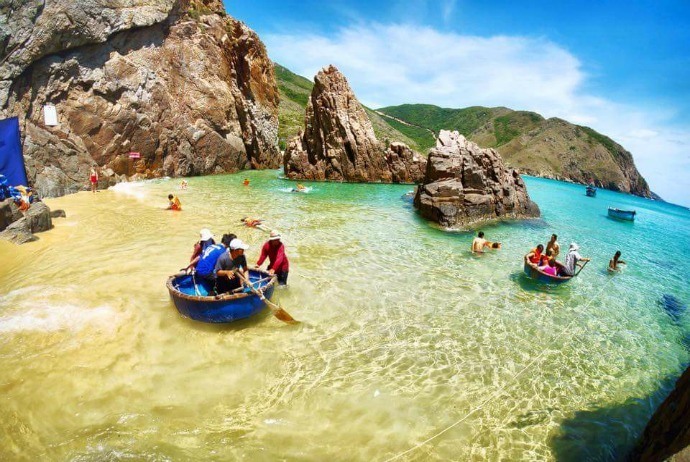 From Quy Nhon, you could hire a motorbike or take a taxi to go to Eo Gio (Eo Gió), then hire a canoe or boat to get to Ky Co. About 100 meters from the shore, you will have a happy experience when climbing on the basket boat to get onto the island. Here, you can feel an impressive nature picture with beautiful colors of seawater, sand, and sky. The seawater’s color is divided into 2 colors, blue inshore and dark blue offshore. Cliffs form a unique natural swimming pool. It is very great when you could immerse yourself in the quite, clear seawaters. The stretching white sand also exalts the beauty of the cost. If you love adventure, then you could climb onto the cliffs and jump down the sea. Delicious fresh seafood is another plus point of this place. 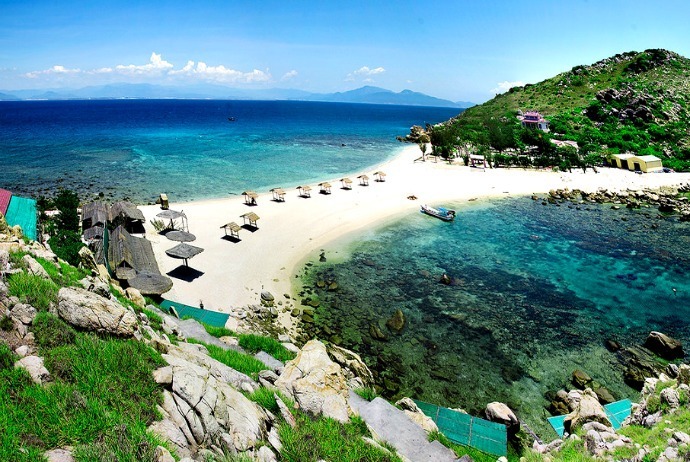 The cost of discovering this pristine paradise is about 300,000 VND / person. Khem Beach belongs to An Thoi (An Thới) town, located in the south of Phu Quoc (Phú Quốc) island, about 25 km from Duong Dong (Dương Đông) town (Phu Quoc (Phú Quốc), Kien Giang (Kiên Giang)). From An Thoi, go to the east about 2km or from Sao Beach, go to the path of 2km, you will reach Khem (Khèm) Beach. 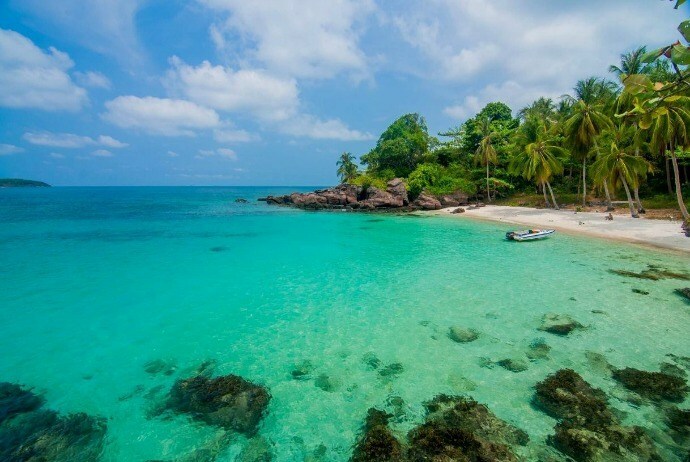 This is one of the most beautiful beaches in Phu Quoc, with the unique bow shape, peacefully located between the two primeval forests. The seawater is incredibly blue, white sand is powdery. The majestic cliffs also create an impressive scene, giving an unforgettable impression to tourists. This is an ideally quite place for relaxation, fishing and snorkeling. At the last of this beach, there is a relic named Gieng Tien (Giếng Tiên) (Tien Well) tied to historical legends. Now, you have discovered 6 newly known beaches in Vietnam which are worth a visit not only due to beautiful scenes but also fresh seafood and friendly locals. So, why don’t you pack your luggage and start your trip to one of these beaches?